In Thoroughbred breeding there has always been exceptions to the normal established mindset of breeders. In the case of the Northern Dancer tail male line, greys had not fared well as race horses or as sires. Sired by Northern Dancer’s exceptional son Sadler’s Wells, El Prado would make his mark as a champion in racing and breeding. El Prado was not only a grey, but he was perceived by North American breeders as a turf sire. He also overcame this distinct bias toward his pedigree and race record. Bred in 1989 by Lyonstown Stud in Ireland, El Prado was by Sadler’s Wells – Lady Capulet by Sir Ivor. Lady Capulet was a daughter of the very good mare Cap And Bells by Tom Fool. Cap and Bells was known as the dam of the very good racer and sire Drone as well as Sir Wimbourne, the latter being a full brother to Lady Capulet. Lady Capulet raced only three times, all as a three year old, and won the Irish 2000 Guineas, finished second in the Coronation Stakes and third in the Pretty Polly Stakes. Sir Ivor was one of the great champions in European racing and was a proven sire, especially with his daughters. Looking further into her pedigree, we see Mahmoud as the sire of her second dam Ghazni. Mahmoud also appears in her fourth generation as the sire of Mr. Trouble, the dam sire of Sir Ivor. The grey colouring of Lady Capulet descends directly from Ghazni. Sadler’s Wells was in the early stages of his ground breaking stud career when he covered Lady Capulet. He was already known as the sire of In The Wings, Salsabil and Old Vic by the time his grey son out of Lady Capulet entered the sales arena as a yearling. This youngster was also a half brother to stakes winner Entitled, and had a further cross of Mahmoud in his pedigree through Sadler’s Wells (fifth generation). Robert Sangster and his associates purchased this well bred colt and he was sent to Ballydoyle to be trained by the one and only Vincent O’Brien. El Prado became the champion two year old in Ireland after winning the Railway Stakes, National Stakes, and Beresford Stakes. He would also finish second to St. Jovite in the Anglesey Stakes as well as winning his maiden race. Back as a three year old, El Prado went unplaced in three races, two of which were group one events, after a late start to his season. The decision to retire El Prado was made. At this time leading Canadian breeder Frank Stronach was on the lookout to acquire a well bred stallion to stand in Kentucky. His Ontario farm manager Dermot Carty arranged the purchase of El Prado from the Coolmore people in a private deal for Stronach. El Prado would take up residence at Brereton Jones’ Airdrie Stud on Stronach’s behalf until the stallion was moved to Stronach’s new Adena Springs farm in Kentucky, after the facility was ready for operation. From here, El Prado forged a wonderful career as a sire and would also change preconceived notions towards potential stallion biases. Now even though El Prado was very well bred, won a championship as a two year old and was a very correct looking individual, it was still a risky proposition to stand him in Kentucky. 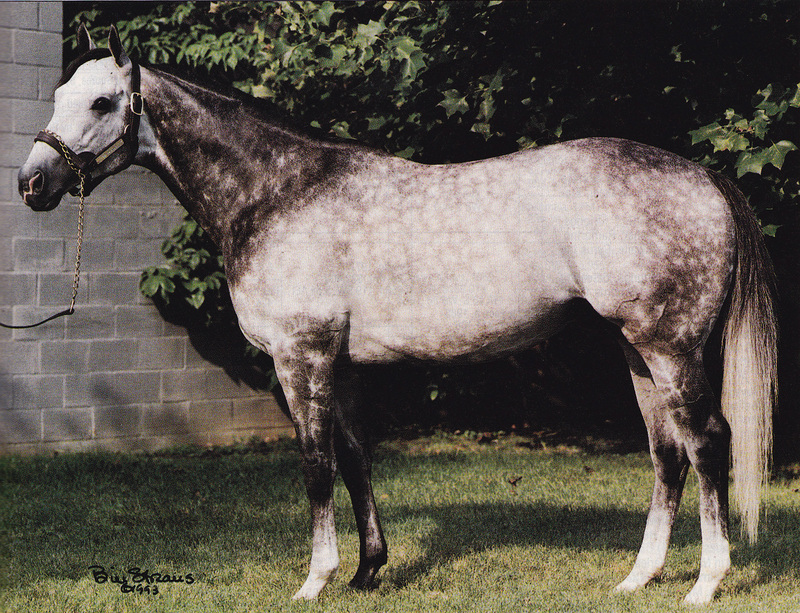 As stated, greys had not fared well along the Northern Dancer sire line. Northern Jove at the time was the only grey to have any success, which was modest, along the ND sire line. Furthermore, El Prado was seen as a turf sire, which in the mindset of many North American breeders hampers his chances to succeed in a predominantly dirt track racing world. To add to the dilemma, sons of Sadler’s Wells had not by this time, covered themselves in glory as stallions. This of course would change dramatically with the advent of Galileo, Montjeu, High Chaparral and of course El Prado. In The Wings had some success by this time, but mostly with distance types in Europe and elsewhere where grass surfaces are king. In 1993 this revelation was still in the future. To say that El Prado was supported in his first few years at stud would be a gross understatement. His initial stud fee of $7,500 actually decreased to $5,000 before the achievements of his get forced breeders to stand up and take notice. By the time of his passing in 2009, El Prado’s stud fee had risen to $75,000 which would be eagerly paid by those who were successful in obtaining a breeding season. Nite Dreamer was one of El Prado`s first good stakes winners taking the Cornhusker’s Breeder’s Cup Handicap, Vandal Stakes, Sunday Silence Stakes and Sportsman’s Park Handicap, all dirt races. He would also place in the Prince Of Wales Stakes, Louisiana Derby, Stephen Foster Handicap and Washington Park Handicap. Nite Dreamer earned well over one million dollars. The first major stakes winner sired by El Prado was the exquisitely beautiful Medaglia d’Oro. In a successful career on the track, Medaglia d’Oro won the Travers Stakes, Whitney Handicap, Donn Handicap, Jim Dandy Stakes, Strub Stakes, Oaklawn Handicap and San Felipe Stakes. He placed second in the Belmont Stakes, Dubai World Cup, Wood Memorial, Pacific Classic and twice in the Breeder’s Cup Classic. From seventeen starts, Medaglia d’Oro won eight and finished second seven times to earn a hefty $5.7 million. Retired to stud at Hill ‘N Dale in Kentucky, he moved to Stonewall farm, and then to his current home at Darley Stud in Kentucky. Medaglia d’Oro sired the remarkable filly Rachel Alexandra, winner of the Preakness Stakes, Kentucky Oaks, Haskell Invitational, Mother Goose Stakes, Woodward Stakes, and six other graded stakes races. She was the Eclipse Award Horse of the Year as a three year old. Rachel Alexandra won thirteen of nineteen races and placed second in five more. She has had her troubles as a broodmare, barely surviving the foaling process, but her two year old daughter Rachel’s Valentina is a grade one winner (Spinster Stakes) and just recently finished second in the Breeder’s Cup Juvenile Fillies. Medaglia d’Oro is also the sire of grade/group one winners Marketing Mix, Vancouver, Mshawish, Violence, Plum Pretty, Coffee Clique, Lochte, Warrior’s Reward, Passion For Gold, Champagne d’Oro, and this year’s Breeder’s Cup Juvenile Fillies winner Songbird. His stud fee of $150,000 is currently one of the highest fees in North America. He has been consistently in the top ranks of sires during his stud career. Artie Schiller by El Prado won the 2005 Breeder’s Cup Mile over Leroidesanimaux, as well as the Bernard Baruch Handicap, Maker’s Mark Mile, Jamaica Handicap and Hill Prince Handicap. He has been retired to stud at Hurricane Hall in Kentucky, later moving to the expansive Winstar Farm. So far during the early stages of his stud career, Artie Schiller has been well received and has sired twenty-seven stakes winners including My Conquestadory, We Miss Artie, Mr. Commons and Laser Hawk. El Prado is the sire of Borrego (Pacific Classic, Jockey Club Gold Cup), Multi stake winner Fort Prado, the steady and consistent Asi Siempre (Spinster Stakes), Paddy O’ Prado who won five stakes including the grade one Secretariat Stakes, Spanish Moon (Grand Prix de Saint-Cloud), the very durable Porto Rican champions Mi Pradera and Quimera, Polish champion Ruten, and the very fast and consistent Winter Memories (Diana Stakes, Garden City Stakes). In 2001, El Prado became the sire of a big chestnut colt out of the Lear Fan mare Kitten’s First. The colt was bred by Kenneth and Sarah Ramsey, who named him Kitten’s Joy. Kitten’s Joy won nine of fourteen races in his career, placing second four times. He was named the Eclipse Award champion Turf Male in 2004 after his victories in the Secretariat Stakes, Joe Hirsch Memorial Classic, American Turf Stakes, Virginia Derby, Tropical Park Derby and Palm Beach Stakes. He ran second to Better Talk Now in the Breeder’s Cup Turf. The Ramseys, a Kentucky couple who have become a force in Thoroughbred breeding due largely to the exploits of Kitten’s Joy, would stand their champion at their farm in Nicholasville Kentucky. Kitten’s Joy had to overcome the same preconceived notions by breeders that his sire had when entering stud as to being a turf sire. With a great deal of faith, the Ramseys have invested heavily in broodmares to breed to Kitten’s Joy. This investment has reaped spectacular rewards for the couple and has vaulted Kitten’s Joy to the elite ranks in North American breeding. Kitten’s Joy became the leading sire in North America in 2013. While many of his get are predominantly grass specialists, there have been quite a few sons and daughters that have excelled on all types of racing surfaces. Among the many notable stakes winners he has sired are Admiral Kitten (Secretariat Stakes), Real Solution (Arlington Million, Manhattan Handicap), Malaysian star Littlebitofjoy, Big Blue Kitten (United Nations Handicap twice, Sword Dancer Handicap, Joe Hirsch Turf Classic), Kitten’s Dumplings (Queen Elizabeth II Challenge Cup, Regret Stakes), Bobby’s Kitten (Breeder’s Cup Turf Sprint), and recent Breeder’s Cup Filly and Mare Turf winner Stephanie’s Kitten. The latter has also won the Breeder’s Cup Juvenile Fillies Turf, Alcibiades Stakes, Just A Game Stakes and the Flower Bowl Handicap twice. El Prado became the leading sire in North America in 2002. He was constantly in the upper five percent of all North American stallions during his stud career. He sired one thousand and twenty-seven foals, eighty-eight of which became stakes winners. He has become a sire of sires with his sons Kitten’s Joy, Medaglia d’Oro, Artie Schiller and Paddy O’ Prado leading the way. The early daughters of El Prado that have become broodmares have produced the likes of Outstrip (Breeder’s Cup Juvenile Turf, Champagne Stakes), Bachelor Blues (Summer Stakes), Stefer (Prix Miesque), Tom’s Tribute (Eddie Read Stakes), Lady Of Kyushu , Savvy Street, Cobalt Blue (San Felipe Stakes), She’s All Ready, Cocktail Attire, Believe You Can (Kentucky Oaks, Tempted Stakes), and Art Show. As the later daughters of El Prado become producers, I am sure that there will be rise in stakes winners as these daughters were bred from more productive families, due to the increase in popularity by breeders toward El Prado as he proved himself. El Prado stood 16.0 hands and was an attractive well made muscular horse. He had strong hinds and straight back legs. His fore arms were muscular and he had very good shoulders. When Stronach acquired him for stud duty, he had not been in the business of standing stallions before. Stronach had been involved in racing for at least two decades, winning some very big races with the likes of Glorious Song and other well bred horses he purchased. Stronach decided to commit fully to breeding and racing by establishing Adena Springs breeding centres in Kentucky, Ontario, Florida and Maryland. With the success of El Prado, Adena Springs has vaulted quickly to the top ranks of stallion farms in the world. Current star sires such as Awesome Again, Ghostzapper, Milwaukee Brew and Silent Name would not have been possible without the financial and prestigious success provided to Adena Springs by El Prado. Thus the grey son of Sadler’s Wells became a foundation sire to an empire. El Prado proved the doubters wrong. He was a gamble to stand in North America but he overcame the detractors and flourished in his stud career. He was a long shot winner at stud and has set forth a thriving high class tail male line descending from his sire Sadler’s Wells and grand sire Northern Dancer. A rare grey from a world class sire line, and a perceived turf specialist siring high class stakes winners on all kinds of racing surfaces. Talk about versatility! As Dermot Carty said “He was a very impressive horse”. I think most of us heartily concur! Nice piece. Note that Medaglia d’Oro first stood at Hill ‘n’ Dale, not Stonewall. Thanks for the heads up Sid. I have corrected the error.